Transport a single canoe or kayak from the parking lot to the lake easily and hassle free with our Canoe and Kayak Dolly. It is designed to hold a canoe/kayak by the hull in a V-shaped cradle with 3-1/2 "L foam bumpers on each arm. Cradle arms are connected together with a 13" nylon strap to prevent the cradle from opening too far. Capacity : 120 LBS 12 Ft long tie-down strap, easy to install. Solid Metal frame; foam bumpers on each arm to protect your Canoe / Kayak hull. Sturdy double-leg kickstand allows easy loading. Large(9-1/2"D) tires (3-1/2" wide) roll smoothly across sand and gravel. Stainless steel fasteners and chrome lynch pin. Quick assembly, only wheels need to be attached. Material : Aluminium pipe (20 x2mm) anodized Stainless steel. 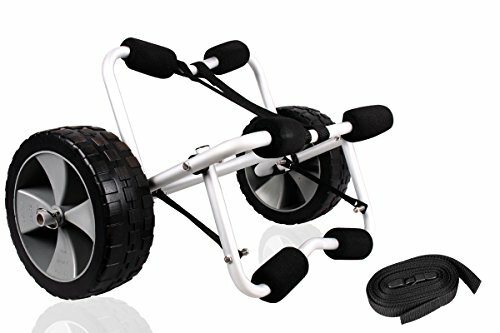 Works great as a kayak dolly or canoe dolly. Dolly breaks down for easy and convenient storage or transport. Part of the support stand features a 9-1/4"H spring-loaded stand which keeps the dolly cart propped up onshore for quick loading out of water. Large 9-1/2" diameter tires provide stable support on uneven terrain which is especially useful in sandy areas. Easily rest a kayak or canoe on the dolly cart platform, strap it down and it's ready to go. It is foldable, easy for storage.